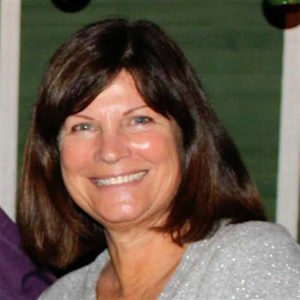 Editor’s Note: In the second installment of a multi-part series, we hear from Jeanette Hayhurst, a long-time and avid horsewoman from Barstow, California. 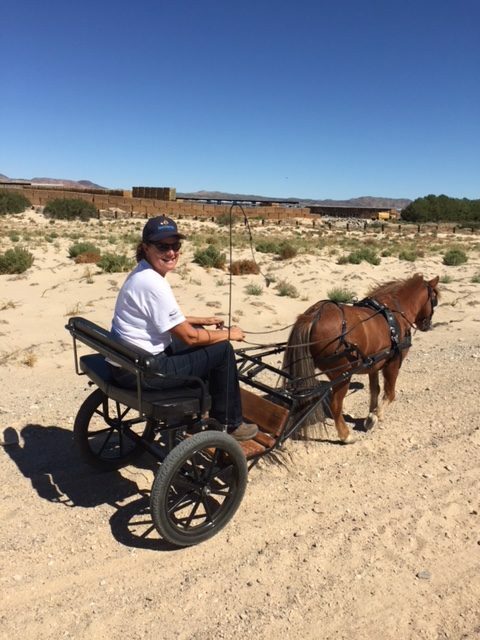 Like many of us, she has continued to connect with horses, even when her age and physical limitations kept her from doing a lot of riding. Kudos, Jeanette! Now I started to get serious. 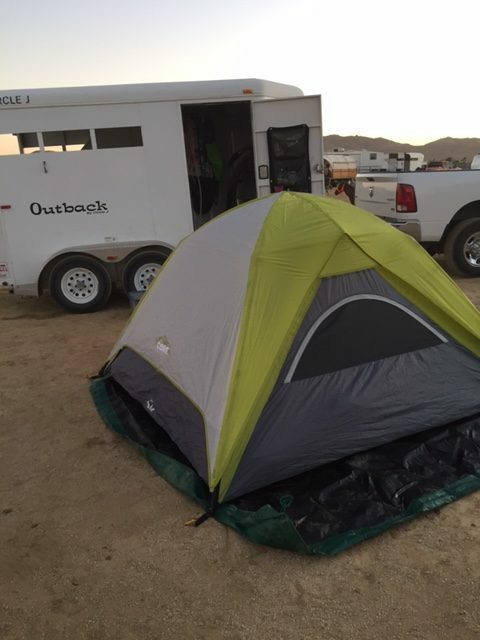 Not only did Danny need conditioning, he’d also need to learn to stake out since there wouldn’t be corrals or anything to tie to overnight while in Death Valley. 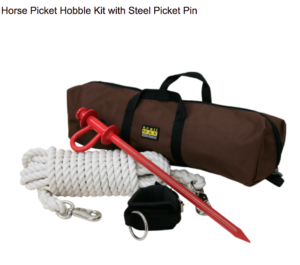 I bought a tie-out system that includes a metal stake that you drive into the ground with a swivel ring on top. To the ring, you attach an eight-foot line (that is more like thick tubing and doesn’t tangle) and then clip the other end to a web halter. Check out picketing options here. I took a few weeks to get him prepared. First, I got him used to the tubing by using it for his lead. I led him around and lunged him in it several times. I practiced driving the stake into the ground with a sledge hammer. I attached him to the stake and moved him around in a circle so he knew where the boundary was. Pretty quickly, he figured out how to step over and around the tube. We did this enough times that I felt confident he wasn’t going to hit the end of the line and break his neck. Another thing I had to get Danny used to was wearing hoof boots. 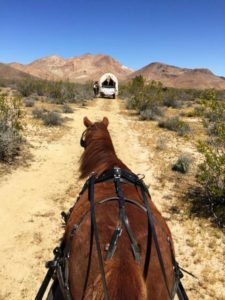 Everyone told me that the wagon trails in Death Valley were extremely rocky in places and that he would need boots. 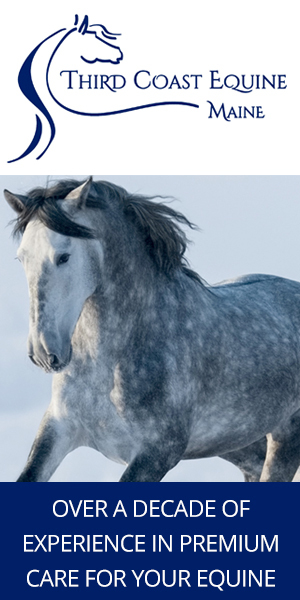 I have used hoof boots on my saddle horses for years so I am familiar with the different styles and features, but finding boots for minis is a challenge. Since Danny is a large mini I finally settled on some small pony-sized boots for his front feet and bought the largest mini size available for his back feet. I practiced with the front boots first and at first he did a little high-stepping and pawing with his front feet. Later, we added the back boots. He got so he didn’t even notice them. Without a wagon big enough to sleep in, I’d have to bring a tent and all my camping supplies. This meant I’d have to set up my own tent. I will admit that I usually leave things like this to my husband, but since he wasn’t going I need to learn how to do it. He conducted practice drills with me for setting up the tent and blowing up the air mattress. Oh, and then I had to figure out how to take everything down and shove it back into the bag it came in. My new motto: It’s a lot of work to have fun! Corral 14 was hosting an overnight Fall Wagon drive in September so I set my sights on going to see if Danny and I were on track for Death Valley. I continued to drive Danny regularly with his two-wheeled cart to work on his conditioning. My goal was to drive twice a week and make sure we practiced going up and down hills, on and off the roads, as well as stopping and standing still. As I’ve said before, Danny is very forward so we did lots of trotting and cantering. The standing still part was the most difficult for him. Time flies and soon I was I packing up all my camping supplies and driving equipment for the fall drive. I hoped I had remembered everything but since we were camping out at someone’s house in their horse arena I figured it was a good place to learn. When we got there I staked Danny out and made sure he couldn’t reach any of the other horses or mules. He was interested in everything but wasn’t hyper. I was pleased. My tent set-up drills paid off and I got my ground tarp and tent staked down without too much difficulty. I used the pump to blow up the air mattress, laid out my sleeping bag, and was ready to camp. The next morning I woke up and fed Danny. Most of the animals had done this before and all of them were pretty calm. My friend brought her camp stove, so I got my morning cup of coffee. All was right with the world. After breakfast I tied Danny to the trailer and put on his harness. I didn’t want him standing too long, but I knew I had to be ready when the wagons pulled out at nine. As the others started to hitch up their wagons I hooked up Danny’s cart. I got in, went around to the starting point, and moved off to the side. I didn’t want to be in anybody’s way. Soon the wagons came out and we were off! The day was a blur, but Danny and I both felt good. We brought up the rear and kept up with the group. The lead wagon set a fairly slow pace so although Danny trotted some he could actually walk and keep up. We went on the dirt roads and then traveled along side a two-lane highway. Then all of us in the wagon train crossed the highway and continued on. A few hours later we stopped for lunch. The wagons can’t be left unattended but I was able to tie Danny with the outriders’ horses. I offered him water. He drank a lot. Soon, we were back on the trail and before I knew it, the drive was over. I was proud of Danny; he’d spent six hours on the trail and was still raring to go. I knew he had plenty of energy left for the next day. Jeanette- even though this took part some months ago I enjoyed part 1 & 2 and plan to read them all. Most importantly I am going to share this with a friend who two weeks ago got her cart for her mini. How timely this is. She will be thankful for your info and encouraged to get on the ‘trail’ with her little guy. I used to have an amish standard bred and an amish buckboard which was great fun (bought both in Wisconsin) and added a very cool new horse perspective. I am still a passionate horseman riding nearly every day. Keeps me sane. Hope you have more adventures in you hip pocket.